Social media managers and other marketing professionals need to have a solid grasp of the social media platforms that their audience uses. This inevitably means that you’ll consider both Twitter and Facebook. Sprout Social suggests that comparing Twitter to Facebook is like looking at Coca-Cola and Pepsi or Android and iOS, as these companies represent the two largest sets of names in their respective industries. You can become much more effective with your marketing efforts by analyzing Twitter vs Facebook, understanding how customers and clients use them and applying relevant data. Twitter and Facebook now have ways for you to target and connect with your audience — organically or by using paid advertising methods. Looking at the purpose and audience of these two social media giants can help you determine how to spend company time and money. Facebook users generally want to see what’s going on with their friends and family members. There are also community pages, apps and games that may interest Facebook users. This audience doesn’t necessarily look for valuable content or company news on Facebook. That’s where Twitter comes in. Twitter is where people come for real-time content. Users can follow along with events taking place around the globe. They can discover content from people they don’t know, making it easier to connect your brand with Twitter users. Of course, this can also work against you. The rapid pace of Twitter can make it difficult to engage with your audience. Within seconds, your audience’s Twitter feed can become inundated with new tweets. Learn the skills needed to succeed in the communications world with the online M.A. in Contemporary Communication from Notre Dame of Maryland University. For years, the audience of Facebook has become older, moving from the millennial generation toward people who are 50 years old and up. There are still young users on Facebook, but there has been a shift as younger audiences move on to the next trend. Most people on Twitter are under 40 years old. The fast-paced, real-time nature of Twitter appeals to this demographic. As a result, most businesses don’t ignore this social media platform. Here are some figures that can help you understand the size, scope and nature of Twitter and Facebook. 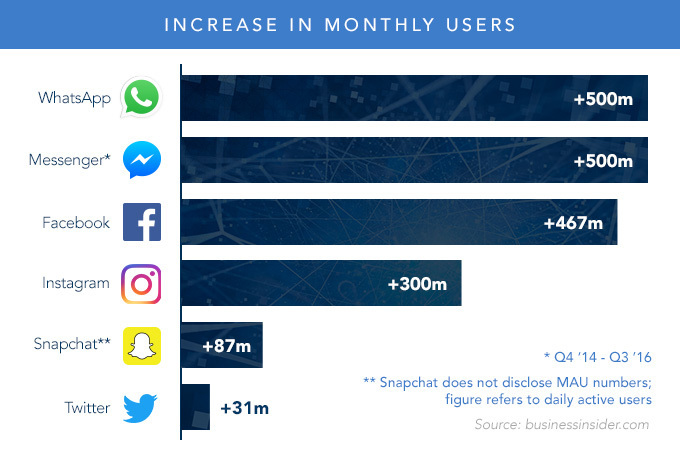 As of June 2017, Facebook has more than six times the number of active users as Twitter. Twitter “appears to be in a prolonged rut,” according to Business Insider. Twitter lags significantly behind Facebook and other social media platforms/apps for growth. Twitter has distinct advantages over Facebook in a number of demographic areas. Twitter vs Facebook: What’s Best for Your Business? Typically, most businesses find that it’s not a question of which social media giant to use — it’s a question of which platform to focus more time and money on. Notre Dame of Maryland University’s online master’s in contemporary communication helps students develop their skills in emerging media forms like social media. Graduates learn how to apply critical analysis, creative insights and technological competence in their career, so they are prepared for positions in social media management, PR, organizational communication and more. The program takes place in a fully online learning environment.